Pre-order price: $119.95; the .pdf version is on sale now at $59.95. Disclaimer: I backed this Kickstarted reprint, to .pdf level only. I'm not made of money! If you've ever delved into Call of Cthulhu's murky depths, then you know there are some campaigns best spoken of in whisper. Horror on the Orient Express is probably the system's most infamous campaign, never reprinted in English, worth a fortune on eBay. Recently Chaosium Kickstarted a reprint edition and raised more than $200,000 on a $20,000 ask, allowing it to do pretty much whatever it wanted and then some. Now new players can ride the world's most famous train, prevent madmen from obtaining all the pieces of the mysterious Sedefkar Simalcrum, and hopefully destroy one of the most potent occult artifacts ever created. Oh, and try not to die. That last part's kinda key. In the original edition -- which I fell in love with as soon as I saw it -- you got four separate campaign books with 13 scenarios in all, passports, luggage stickers, train car plans, a complete cardstock Simalcrum, handouts, and a book full of Strangers on the Train to plague your players with. The reprint boasts updates to some of the existing scenarios, six new scenarios, extra maps, a player-specific Traveler's Companion, die-cut Simalcrum, postcards, a matchbook, luggage stickers, all the Keeper aids in the original, and more. This campaign will keep you busy for a long, long time. There could be years of play here. You start the campaign wanting to find out what happened to your friend, Professor Smith. Ruffians burned his house down, and threaten his life, all because he dared to track down the infamous Sedefkar Simalcrum, a cult artifact that promises unimaginable power to whoever can put it back together again. At the moment it's scattered across Europe, but the Professor thinks he knows where most of the pieces are, and how to destroy them. Unfortunately the latest cult attack left him incapacitated with third degree burns over most of his shattered body, so it's up to the players to collect the missing bits, before some evil madman reassembles it and gains ultimate power. 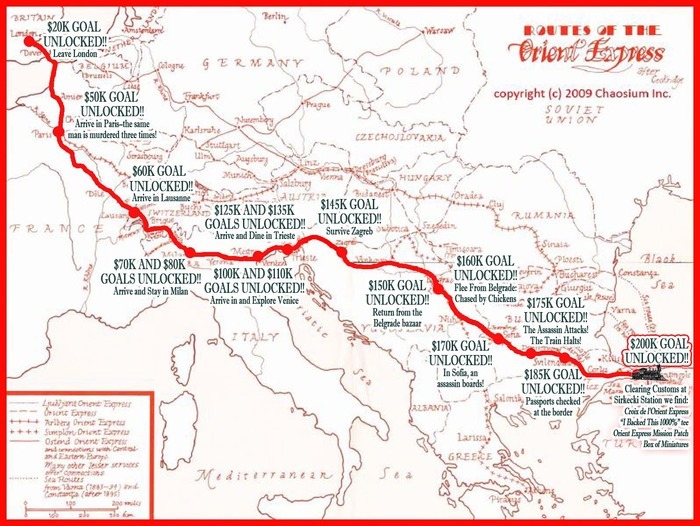 Once the plot's established the players explore Europe aboard the famous Orient Express train which, as luck would have it, is going to almost every destination the characters need to get to. On the way they'll encounter movie stars, opera singers, honeymooners, spoiled children, corpses (animate and otherwise), spies, cultists, ghosts, witches, anarchists, pickpockets, and one very determined revenant. Will the characters succeed? Will their flayed skins, left on some blood-encrusted altar, be the only sign that they failed? There isn't space here to go over every single scenario in the book. I will say that, where the reprint expands on the original scenarios, it's almost always for the better. Either the new material adds to and explains part of the plot which otherwise would have confused everyone, including the Keeper, or it adds new scares in what's otherwise a pretty quiet scenario. The use of 7th Edition rules exclusively may be a sticking point for some. If you've played CoC then you know that, for the last 30-plus years, the system mechanics really haven't changed at all, but 7th -- which isn't even in print at time of writing -- introduces a lot of new rules and changes character creation. It's not impossible to convert 7th back to 6th Edition, and OE anticipates this with a section that shows you how to do just that. It does mean that Keepers used to the old way of doing things need to keep an eye out for changes. For example, the concluding scenario can end with a contest of wills (POWer vs POWer) between the antagonist and a player. In Ye Olde Days that meant comparing the two stats and making a single roll based on that comparison. In these shiny modern times there are two rolls, and the results of those rolls are compared to see who got the better result. People used to the previous system need to be careful, or be caught out.